Tír Pholainéiseach is ea Samó atá suite san Aigéan Ciúin. 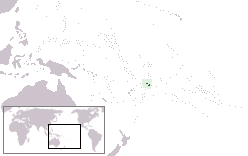 Malo Saʻoloto Tutoʻatasi o Sāmoa nó Independent State of Samoa a thugtar uirthi go hoifigiúil. Bhain sí neamhspleáchas amach ón Nua-Shéalainn sa bhliain 1962. Is iad Upolu agus Savaiʻi na príomhoileáin. Is í Apia an phríomhchathair. Tá sí suite in Upolu. Tugadh an leathanach seo cothrom le dáta an 16 Meitheamh 2017 ag 06:34.